The Araguaian river dolphin or Araguaian boto (Inia araguaiaensis) is a South American river dolphin population whose identification as a species distinct from the Amazon river dolphin (Inia geoffrensis) was announced in 2014. It is native to the Araguaia–Tocantins basin of Brazil. As of October 2014, I. araguaiaensis is not recognized as a separate species by the Society for Marine Mammalogy. Their Committee on Taxonomy made these comments regarding the decision to not include I. araguaiaensis as an independent species: "Inia araguaiaensis, was described by Hrbek et al. (2014). However, this study only examined samples from two extremes of the distribution of Inia so is it unclear if the molecular differences observed represented real species-level separation or were due to sampling from two locations separated by a large distance. Diagnostic osteological differences were also reported. However, because this was based on the examination of very few specimens (only 2 for the new species and only 9 for I. geoffrensis), the authors’ conclusions are very concerning." The recognition of I. araguaiaensis as a separate species was announced on January 22, 2014. It was distinguished from other members of Inia on the basis of nuclear microsatellite and mitochondrial DNA data as well as differences in skull morphology (it generally has a wider skull). It also differs from the Amazon and Bolivian river dolphins in the number of teeth per hemimandible (24–28 versus 25–29 and 31–35, respectively). 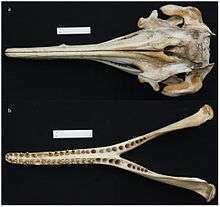 It is the first new river dolphin species to be described since 1918. 1 2 3 4 5 6 7 8 Hrbek, Tomas; Da Silva, Vera Maria Ferreira; Dutra, Nicole; Gravena, Waleska; Martin, Anthony R.; Farias, Izeni Pires (2014-01-22). Turvey, Samuel T., ed. "A New Species of River Dolphin from Brazil or: How Little Do We Know Our Biodiversity". PLOS ONE. 9: e83623. doi:10.1371/journal.pone.0083623. PMC 3898917 . PMID 24465386. ↑ "List of Marine Mammal Species & Subspecies". Society for Marine Mammalogy. ↑ McGrath, M. (2014-01-22). "Brazil dolphin is first new river species since 1918". BBC. Retrieved 2014-01-23. ↑ Anderson, N. (2014-01-24). "Inia araguaiaensis: New Species of River Dolphin Found in Brazil". Sci-News.com. Retrieved 2014-01-30. ↑ "Animal Info - Boto (Amazon river dolphin)". Endangered Animals. AnimalInfo.org. June 7, 2006. Retrieved January 25, 2014. ↑ Best, Robin C.; da Silva, Vera M.F. (1993). "Inia geoffrensis" (PDF). Mammalian Species. The American Society of Mammalogists. 426: 1–8. doi:10.2307/3504090. ↑ "Boto (Amazon river dolphin)". American Cetacean Society. Fact Sheet. Retrieved January 25, 2014. ↑ "Projeto Boto do Araguaia". Araguaia.org (in Portuguese). Instituto Araguaia.